Zak's Sidewalk: Now for some adorable. At our new apartment, on the base of the mailboxes, in the lower right hand corner, is the tiniest paw print pressed in the poured concrete. It looks like a waypoint. Like a little puppy "CROATOAN" -- a mystery for all future dogs to ponder. 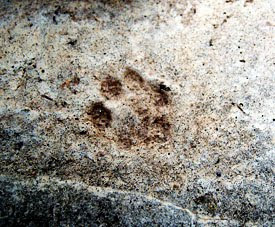 Is this paw print a clue to find him? Or simply a reminder he was here? Which reminds me. There's a little pug who lives on the same courtyard. Rather, his master lives on the same courtyard and I suppose the pug subleases. But apparently, the pug's old best friend, another pug, used to live in our apartment. So everyday, the little beastie wiggles up to our red door and tries to nuzzle it open to play with his friend. When he hears little Marlowe barking and scratching, it only confirms for him that his old puppy pal is behind the door. 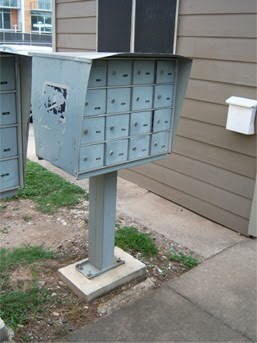 Perhaps it was the pug, our apartment's former tenant, that left the paw print at the mailbox. An indelible farewell to his little friend.